*Festival registration is required for all events. Registration does not include meals and workshops. Public Poetry "POETRY RIDE from HOUSTON to ROUND TOP" participants: register on the Public Poetry website. Sign up for Workshops and Consultations below. *Meals are optional. Festival registration is required. Email special dietary needs to reservations@festivalhill.org. Limit 3 per person. *Workshops are optional. Festival registration plus workshop fee is required. 75 minutes/workshop. A workshop may sell out while you are making your purchase. Delete the workshop, complete checkout, and send email to be added to a waiting list. Limit 1 per person. *Consultations are optional. Festival registration plus consultation fee is required. 30 minutes/session. A consultation may sell out while you are making your purchase. Delete the consultation, complete checkout, and send email to be added to a waiting list. Donations may be made in increments of $25 (qty of 1 is $25, qty of 2 is $50, etc.). Donations may also be made by using the Donate button elsewhere on the website. Indicate "Restricted to Poetry." TIP: Before clicking the button to purchase, log into your account with your email and password. Then return to this screen. You may need to create a password or register your email and create an account. You can start by entering your email at this link. If you have problems with your password, call the office at 979-249-3129. More Information is available on the Poetry at Round Top website. Register for the Festival on the Public Poetry website as part of the Poetry Ride Package. Sign up for Workshops here. Click on the "View Prices and Purchase" button above. Featured Poets include Major Jackson, Marie Howe, Benjamin SÃ¡enz, Vievee Francis, Forrest Gander, Natalia TreviÃ±o, Sherwin Bitsui and Bruce Noll as Walt Whitman. Musical Program by Glenn Rexach. Workshop leaders also include Laura van Prooyen, Octavio Quintanilla and Lucas Jacob. View biographies at Poetry at Round Top/2019 Speaker Bios. The Schedule of Events for the three-day weekend is posted on the Poetry at Round Top website. Workshops. Festival Registration is required plus $40 fee for each workshop. Full descriptions for the optional workshops are posted at Poetry at Round Top/Workshops. Workshops are limited to three per person. Workshops are offered in 75-minute sessions. Manuscript Consultations are Sold Out. A 20% fee will be deducted from all refunds requested on or before April 5, 2019. No refunds can be given after April 5, 2019. A limited number of rooms on the Festival Hill campus are available for overnight accommodations. Select and pay for registration, meals, optional workshops and manuscript consultations online. Send an email to reservations@festivalhill.org or call 979-249-3129 to make room reservations. You may also contact The Cottages on Mill Creek for overnight accommodations. Located just a few miles north of Festival Hill at 5696 Wagner Road, Round Top, Texas 78954, the bed and breakfast graciously donates 100% of the proceeds from poetry rentals on the festival weekend to Festival Hill in support of the Poetry at Round Top Festival. For reservations, call 832-334-2163. Alternate lodging may be found at exploreroundtop.com/stay. 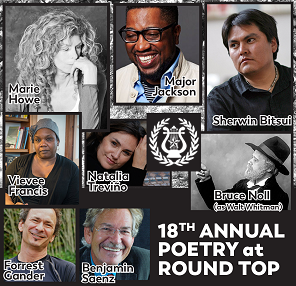 Email poetryatroundtop@gmail.com for more information about the Poetry at Round Top Festival. Email staff@publicpoetry.net for information about the "Poetry Ride to Round Top," sponsored by Public Poetry in Houston. Email reservations@festivalhill.org for information about registration and accommodations. Email websupport@festivalhill.org for technical support with online registration and payment process. Include name, phone number and a few words about the problem.